Ban Ki-moon predicted a catastrophe looming over our world if global warming isn't stopped any time soon. PARIS (Sputnik) — The world faces a "climate catastrophe" if decision-makers fail to strike a comprehensive deal to curb global warming below 2 degrees Celsius (3.6 degrees Fahrenheit), UN General-Secretary Ban Ki-moon said Monday. 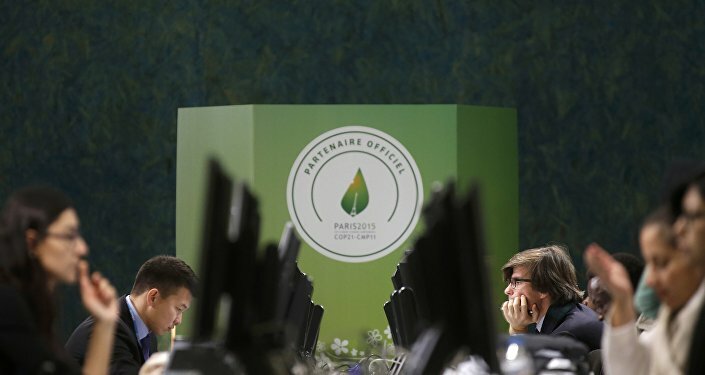 "The clock is ticking towards climate catastrophe," Ban said at the opening of COP21/CMP11 High-Level Segment. Ban outlined the "must-have" provisions of the comprehensive climate change agreement that almost 200 states are scrambling to conclude. "Your [heads of states and ministers, as well as other participants of COP21] task is to translate this historic call for action into a durable, dynamic, credible and fair climate agreement," he underscored. The UN chief urged for five-year government reviews of each country's commitment to the below-2-degrees goal ahead of it coming into effect in 2020. He stressed the need for the public sector to signal to companies that the low-emissions transformation in the global economy is "inevitable, beneficial and already under way." The agreement on climate change is said to have been distilled from 300 to 21 pages over the course of six years of negotiations. The agreement seeks to prevent global warming exceeding 1.5 degrees Celsius, as an increase of average global temperatures of 2 degrees or more has been scientifically proven to have disastrous consequences for the planet.